Kuroneko-sama (黒猫様 lit. 'black cat Martian Lord/Lady') is, as her name suggests, a black cat. (Yasuhiro Nightow has said that the cat is female, and he would know: Kuroneko-sama was one of the first characters he created for the manga.) Her formal name is Kuroneko Kukan, or Black Cat Space. She appears in every episode at least once, usually as a running joke of popping her oval-shaped, green-eyed head on screen at some opportune moment and usually uttering a simple "nyaa." (Some of her appearances are much more comical in nature: one example of this is the first episode of the anime, "The $$60 Billion Man", where the audience can see her leering at Meryl and Milly as they enter the bar, or in the episode "Fifth Moon," when Vash is clearing out the city of Augusta, he fires into the air and is quite surprised when the cat lands on his head with a "nyaa," then jumps off.) Another running gag is everyone thinking Vash turns into her (Wolfwood had said "Though I know you have many secrets,...I never knew you were a cat......?..What-the!?" revealing Vash had ran off.) an becoming angered. Many viewers missed her appearance in episode 17, contributing to rumors that she is a reincarnation of Rem. In that episode, the cat is frozen in the arms of one of the cryogenically-preserved population. This does, however, lead to questions as to Kuroneko-sama's apparent longevity. In vol. 1 chapter 2 she appears and Millie holds her in a funny manner. Kuroneko-sama may have some connection with Vash, but that, like her appearances, is a mystery. Many speculate that she is a reincarnation of Rem, who watches over Vash on his journey. Also, after Vash kills Legato late in the series, Kuroneko scratches him (the only violent interaction Kuroneko takes against Vash in the series); perhaps this is Rem's way of rebuking his decision. However, it is more likely that, if anyone, Meryl is a reincarnation of Rem, as described in her entry above. In fact, Kuroneko-sama often appears as part of a gag and given that she appears in every episode in some way, she seems to be a sort-of "Where's Waldo?" type of character. Her appearances in the manga are not nearly as frequent as in the anime, and Nightow has stated that she is just something easy and calming to draw in between action scenes. His most common response to queries as to her nature or significance at anime convention panels is "Kuroneko-sama is a small black cat," stated fully in English. She could also be considered as a regular black cat that brings Vash bad luck wherever he goes. Kuroneko-sama makes a cameo appearance in Wild ARMs 2nd Ignition. 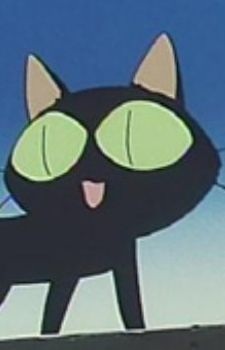 There is also a very similar black cat in the anime FLCL. Some American fans of the series that dislike pronouncing her name have given her the name of Doughnuts. An obvious reference to Vash's love for doughnuts.